Stretching across three time zones and 5000 kilometers, Indonesia is a colorful collection of contrasting cultures and geographical landmarks. One can enjoy the modern amenities of densely populated Jakarta, then travel eastwards on an eco tour to the sparsely inhabited jungles of Papua and Kalimantan.Historical and religious sites such as the Buddhist Borobodur temple and the Prambanan Hindu temple complex (both in Central Java) dot the countryside while most Indonesian cities have their own Islamic Masjid Agung or grand mosque. One can choose between getting pampered in Bali’s first class resorts, enjoying a rustic homestay in Kalimantan or going island-hopping at the unspoiled Raja Ampat Islands in Papua. Indonesian friends in traditional batik wear. 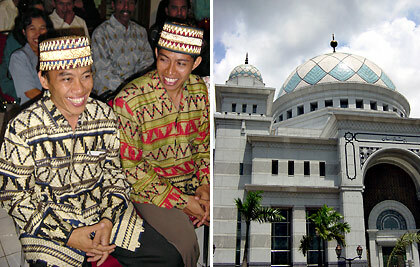 Right: A masjid or mosque in Jakarta. Our previous work took us to different places in Indonesia – particularly to various cities in the major islands of Java, Sumatra, Bali and Sulawesi. Indonesia is the world’s largest archipelago with 17,500 islands, 6,000 of which are uninhabited. And because of the country’s diversity, a visit to Indonesia is always filled with new discoveries and adventure. 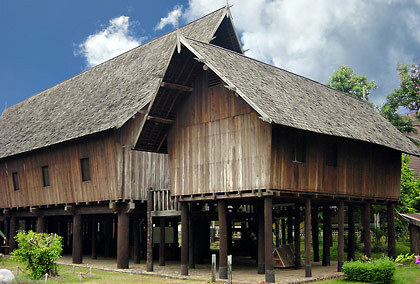 Traditional Bataknese house at Taman Mini Indonesia Indah, Jakarta. Like the Philippines, Indonesia has a bewildering array of ethnic groups – no less than 300 with 742 different languages and dialects. The most numerous ethnic groups are the Javanese, Sundanese, Malay and Madurese. The archipelagic nature of both countries probably explains why such a big number of ethnic groups proliferated. Each ethnic group has its own set of customs and values that can baffle even locals from another group. And while social, ethnic and religious differences have sometimes resulted in violent conflicts not too long ago, diversity has also resulted in a rich fusion of many cultures over the years. Wood carving at a restaurant by a river in Medan, Sumatra. As Filipinos it was fairly easy for us to adapt to Indonesia because of the many similarities in culture including several words shared by the national languages of the two countries. We have been mistaken for locals on several occasions. During our first visit to Jakarta we were pleasantly surprised to discover that we could eat with our bare hands at several restaurants – a practice that is vanishing from the Filipino dinner table nowadays. And to our surprise, some Indonesian friends even mentioned that they were fans of a few Filipino recording artists such as Eddie Peregrina a pop star of the ‘70s. 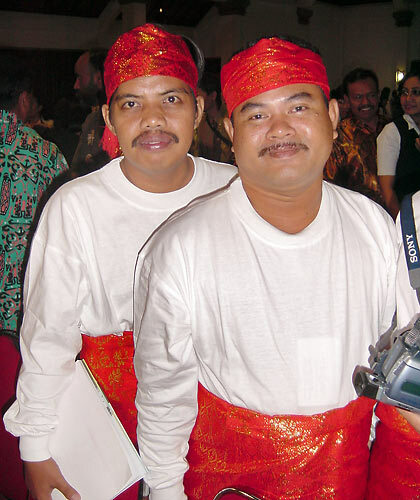 Indonesians in traditional Acehnese attire. Indonesia is famous for its colorful batik cloth, the designs varying from region to region. At one point Leo had a collection of them, almost all of which were gifts from our Indonesian friends. Indonesian wood carving is excellent and we have been treated to outstanding examples where the carving is so delicately fine it seemed almost impossible for a person to execute. And the food! We’ve enjoyed Indonesian cuisine so much Nina has even learned to cook a few dishes which we serve to our guests at home from time to time. There is probably no such thing as a single Indonesian cuisine because of the cultural diversity but we have enjoyed practically every sort of regional culinary offering from spicy, coconut-based Padang cuisine to sweet, deep-fried Javanese dishes. We’ve probably enjoyed seafood the most in Indonesia since it is easy to find fresh seafood almost everywhere. Now available in some groceries here in Manila, Indonesian spices and fast food such as kecap manis (thick and sweet soy sauce), sambal pedas (red chili sauce) and mie goring (fried noodles) are an indispensable item in our cupboard. As the world’s largest archipelago that lies along the Pacific Rim of Fire, Indonesia’s natural attractions are obvious. Of the more than 400 volcanoes, there are at least 167 active ones (more than any other country) including those in the Bromo-Tengger-Semeru National Park, Mount Rinjani in Lombok and Mount Batur in Bali. With more than 18,000 islands, there are thousands of beaches to choose from ranging from the obvious ones in Bali and Lombok to off-the-beaten-track destinations in Maluku, Nusa Tenggara and Sulawesi. Indonesia has some of the world’s last remaining largest tracts of tropical rainforests with extraordinarily diverse wildlife including orangutans, Java Rhinoceros, Sumatran tigers and several species of birds. The Tengger massif in Java, Indonesia, at sunrise, showing the volcanoes Mt. 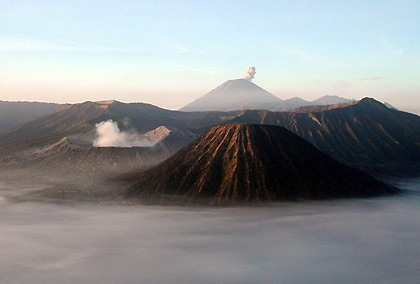 Bromo (large crater, smoking) and Mt. Semeru (background, smoking). Photo courtesy of Wikimedia Commons. Hustling, bustling, modern Jakarta is of course the starting point for exploring the whole country. The capital city sits in the island of Java – the most densely populated island in the country and Indonesia’s heartland. There are other large cities here: Surabaya, Bandung, Yogyakarta and Semarang. Java is also the home of two religious/historical sites previously mentioned: the Borobodur Temple, one of the world’s largest Buddhist temples and Prambanan, a collection of huge 10th century Hindu temples. Both sites are accessible from the city of Yogyakarta, the cultural hub of the country. 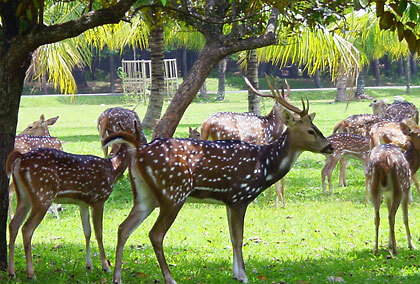 A herd of deer in Bogor, Java. 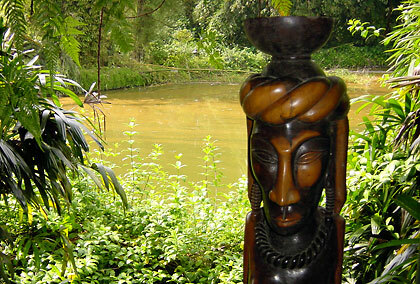 Bali is Indonesia’s most popular destination. Its unique combination of beaches, highland regions, marine life and Hindu culture has made it a favorite among international travelers. Nearby is Lombok and the rest of Nusa Tenggara, a group of islands famous for its beaches and dive sites. The Komodo Dragon, in Komodo National Park, maybe found in this island chain. To the north and northeast lies the major island of Sulawesi and the Maluku (Moluccas) islands. 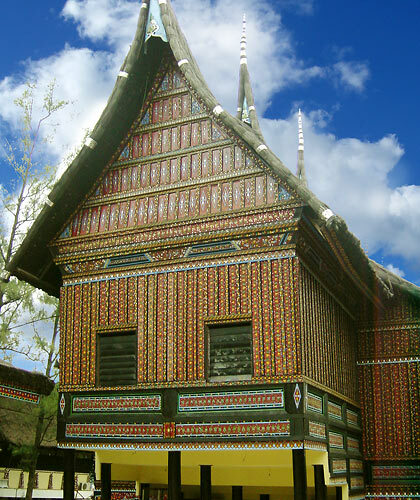 Sulawesi is famous for its Toraja culture, particularly its funeral rites (and coffee). 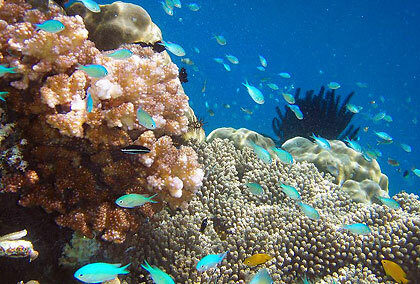 It also has world-class diving at Bunaken, Manado. Papua (formerly known as Irian Jaya), at the western half of the island of New Guinea is the easternmost part of Indonesia and has vast tracts of unexplored, impenetratable territory with its mountains, jungles and swamps. A natural treasure in Papua is the Raja Ampat Islands, an archipelago of karst islands similar to El Nido and Coron in Palawan, Philippines and the islands off Ha Long Bay in Vietnam. Underwater marine life off the Raja Ampat Islands, Papua. To the west of Java lies Sumatra, the sixth largest island in the world, site of the recent (2004) tsunami that roared across the Indian Ocean and caused widespread devastation. Sumatra is also blessed with great natural and cultural wealth including Lake Toba. We saw this lake from a plane on a flight out of Medan and did not realize at the time that it was the largest volcanic lake in the world – the lake itself is the caldera of a dormant super volcano that had a massive eruption in prehistoric times. Sumatra is also the home of the endangered Sumatran tiger. To the east of Sumatra is the island of Kalimantan, the world’s third largest island and home to lush jungles and the orangutan. Having traveled frequently to Indonesia during a period of six years, we can safely conclude that the country is one of the cheapest travel destinations in Asia – definitely a shoestring traveler’s haven. Food, accommodations and transport are relatively inexpensive. Even in Bali, where there are many expensive, first-class resorts, a visitor can still get a superb value for accommodations and food. Fuel is still relatively cheap in Indonesia since it is an oil-producing country. There was a time when most people preferred to travel by boat as a cheaper means of transportation between the thousands of islands in the archipelago but with a proliferation of inexpensive flights brought about by the entry of many domestic airlines in the early part of the millennium, more people have been taking that option. With its rich culture, relatively inexpensive travel costs and a wide variety of destinations to choose from, Indonesia remains one of our best options for travel around Southeast Asia – definitely a place we can keep coming back to.